The start of the new Serie A season is upon us once more. Batteries are recharged, new signings are ready to go and fans are moments away from getting a glimpse of the players who they put all their hopes on. Will it be a familiar tale at the top or will we have a surprise package challenging for the title? Early indications show that Juventus will once again be the team to beat. The nucleus of last season's title winning side have stayed and along with summer signings Carlos Tevez from Man City, for a bargain £8m (€11m) and Bilbao's Fernando Llorente, who joined on a Bosman (free transfer), La Vecchia Signora will be confident of adding another Scudetto to an already full trophy cabinet. So where will the challenge come from? One of the challengers will be AC Milan. Milan have made only modest additions so far this summer but have a wealth of talent in a squad which only sparked into life at the end of the season, when they secured Champions League football on the very last day. Any side which boasts Mario Balotelli, Stephen El Shaarawy and Kevin Prince-Boateng will be a threat and they will be hoping to hit the ground running this time around. Napoli finished second last season but will look very different this time around following the departure of star striker Edinson Cavani and manager Walter Mazzari. Rafael Benítez is the man in the hotseat and he has been very busy in the transfer market this summer. 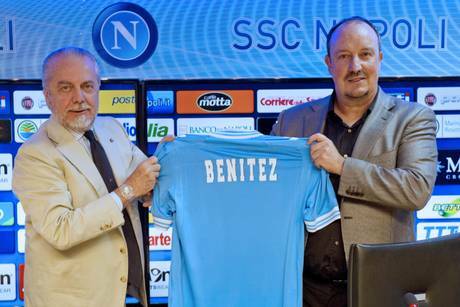 With Cavani leaving for PSG for £55m (€63m) , Benitez has splashed the cash. In came Gonzalo Higuain from Real Madrid, for £34.5m (€40m) along with Pepe Reina, Raul Albiol, Jose Calleron and Dries Mertens among others. They may not last the pace in the league, but I think they will be worthy contenders in the Champions League. Benitez is a master at seeing his sides progress in Europe, don't be surprised to see the Azzuri reach the final this time around. Expect a strong challenge, also, from Fiorentina this season after another busy summer in the transfer market. Il Viola just missed out on Champions League football last year, and despite the sale of Stevan Jovetic to Manchester City, the expectation is that they will be well equipped to aim for the top three again. The marquee signings include Mario Gómez, Josip Ilicic, Joaquin, Massimo Ambrosini alongside a fit again Giuseppe Rossi. It is a big season for underachievers Roma this year. They have appointed a new manager in Rudi Garcia and continue to boast a richly talented squad, despite the departure of Daniel Osvaldo to Southampton and the rumoured departure of Erik Lamela. Kevin Strootman has arrived for £14m (€17m) from PSV and , if he can settle in quickly, could well be the signing of the summer. A European finish is on the cards this time around for I Giallorossi, who were jeered at a pre season squad presentation earlier in the week by the fans. Inter, Lazio and Udinese will be hoping to secure Europa League football again this season at best, although Inter could have the best chance of springing a surprise with a host of new signings to accompany new manager Walter Mazzari into the San Siro cauldron. The battle to stay in Serie A will, once again, be fiercely contested. It is no surprise to see the three newly promoted clubs heavy favourites to make a swift return to Serie B. Sassuolo, Hellas Verona and Livorno will have a tough task in front of them. Hellas Verona look like they will be the best equipped to make a good fight of it after making some very astute signings. Veteran forward Luca Toni has arrived to add much needed experience along with quality players like Bosko Jankovic and Massimo Donati. Sassuolo are playing in the top-flight for the very first time. To add to the difficulties of their maiden season in the big league they will be using someone else’s stadium to play their home games. Last season they called Modena’s Stadio Alberto Braga home but have now relocated to the Stadio Città del Tricolore in Reggio Emilia. Livorno have been in and out of Serie A over recent seasons and they will be hoping that another club will get dragged into the fight to stay in the league. Recent form suggests that Genoa could be the side to drop out this time. I Rossoblu have a first-time manager at the helm in Fabio Liverani, and have not really added to last seasons squad yet. Last seasons top scorer, Marco Borriello, was on loan from Roma and it doesn't look like he will be returning to help them try to climb the table. As I mentioned earlier, I can't see past Juve winning a record 30th title. The race for the two other remaining Champions League places will, in my opinion, go to Napoli and Fiorentina. This could be the year Genoa drop down to Serie B, and I think they will be joined by Livorno and Sassuolo. And so, the wait is almost over, this weekend sees the first matches of the 2013/14 season. I will be posting regular updates throughout the season. I hope you will follow this exciting season of Calcio right here with me.